Have you noticed that the price of everything seems to be going up at the moment? Me too. Well you'd have to have more money than sense not to notice! And it's not just petrol, gas and electricity but food too. Every time I go to the shops there seems to have been a price hike on even the essential products, and more often than not not just a penny here and there, it's a big increase. Tesco has decided to try out a new approach and they are dropping prices. Yep, that's right - they're dropping the prices of hundreds of items around the country. 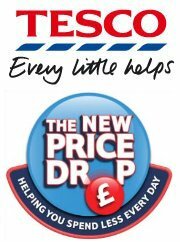 The Tesco Price Drop seems to do just what it says on the tin - there are savings on everyday staples such as eggs, bread, fresh fruit and frozen veg and the not so essentials cakes and biscuits. Although in some households *cough* I reckon cake is very high on the essentials list. Tesco is also encouraging everyone to take part by visiting their Facebook page to see the items on the price drop list and - get this - suggest some of your own. I love this idea and I'll be suggesting a price drop on some of my own essentials. 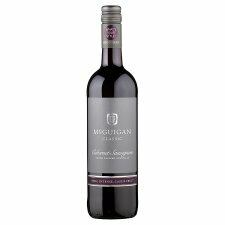 In fact, talking of essentials, I've just been checking out the Wines and Spirits section of the website and noticed my favourite bottle of wine has been reduced!